-These little cuties, from LeAnn, are flying on over to my place, and will probably be waiting for me when I return from FL. I'm excited, they are so cute! - Yesterday I made it to 400 followers, and today I have 399. Hmmm. Lost one. I guess my charm and good looks couldn't keep them around. I wish I knew who it was, I could try to lure them back with beads, or candy. -Last night, Joe got back from a few days in CT. I really missed him, and I am so glad he's home. I cooked a nice dinner, Puttanesca with Haddock. Normally we just make the sauce, no meat, and put it on pasta. Last night we bought some Haddock filets, and cut it up , and put it inside the sauce to cook it, and had it with past on the side. It was so good. My favorite way to make fish. -I am headed to a local spa this afternoon for a Facial. It's the Hot Lava Stone Facial, that comes with a head, neck, hands and feet massage. I got a gift certificate from a cool co-worker, and I'm happy to have a little relaxation time before the stress of travelling. I'm not the best traveller. I get nervous. I worry. Flying doesn't bother me really, but just the befores and afters, finding my luggage, getting to a cab, getting to my hotel. I could do without all that stress. -I was just thinking the other day that it had been a long time since my cat threw up. She normally does when she eats too fast. It happened this morning. Poor thing. And now she's acting kind of weird, like it really took a lot out of her. Gosh, I know that feeling. I'm going to try to blog a little bit while I'm gone. Love the baby owls! Hope your cat is feeling better. Have a fun time in FL! #400 ... Lorelei, your personality and good looks as well as your talent deserve 10x400 followers! Those owls are awesome, Lori! I'm sure you'll find just the right use for them. I'm envious of your facial - it'll be very relaxing, I'm sure. Enjoy your trip and safe travels to you. LOL Love your random thoughts. What a great idea. I agree - when you lose a follower it bugs the heck out of you trying to understand why. Go figure. Wish I could rejoin you to make it 400. The cat thing made me laugh. My cat does the EXACT same thing. We've always called her bulimic. 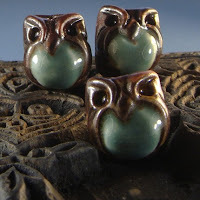 You little owls will be waiting for you when get home for sure. I know the travel stress thing very well. I love to travel. I just don't like the packing, getting on the plane, the taking off in the plane, the getting off....well you get the picture. Have a wonderful time in FL. A little break will be good and warmer weather too! Those owls are sure sweet!!!!! I don't mind flying, but like you, I worry about getting there on time, my luggage getting lost, finding a cab, surviving the cab ride. I love to travel, but not the 'traveling'....if that makes sense. Try not to worry too much, and just have a good time! Aww the Ocean breezes and warmer weather will put a jump in your step for sure! Have a great time! Yes Blog or you will be missed:) Funny you mention the cats mess...I came into the computer room just now and lo and behold puke on the floor from Miss Booboo. Hope mines ok too. Those Owls are treasures! Have a nice trip and a wonderful time in Florida! If there is something you want in the shop, I'll give you the discount on your purchase. 400! WOW I'd be happy with 10. I wish I had more time to check in here. I enjoy your blog tremendously and I miss it when I don't check in. Have a good flight and stay clam. Count me as follower #403! I love all your work and the artists you inroduce to us all. Thank you! I had my first facial a couple of weeks ago, but it wasn't a stone one -- I loved it! For someone with migraines, all the massaging was heaven! Between you & Heather, I am so loving owls now! I hope your cat feels better and *hugs* about the traveling stuff. My worse experience with that when I was being assigned (when I was in the Air Force) to a base in Turkey and no one was there to pick me up. Luckily I struck up a converstation with a couple of Brits and they helped me find my base. I didn't know what the Turkish name of it was!!! You will do great! I love your owls. Your animal-beads is butiful. Thank you for talant, I like your jewelry.